Sign of the Times or just the best PKI book ever? Like a lot of IT Pros, I’ve been studying up on security topics lately, both as a reaction to the increasing amount of breach news (Who got breached this week, Alex?) and because I felt weak in this area. So, I went shopping for some books. My goals were simply to get a baseline understanding of crypto systems and best-practice guidance on setting up Microsoft Public Key Infrastructures, which I’ve done in the past but without much confidence in the end result. 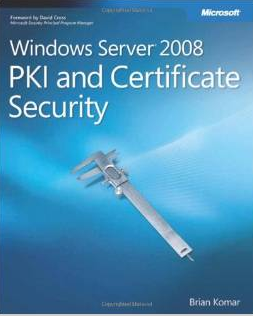 This 3.2lb, 800 page book has a 4.9 out of 5 star rating on Amazon, with reviewers calling it the best Microsoft PKI guide out there. Great! I thought, as I prepared to shell out about $80 and One Click my way to PKI knowledge. That’s when I noticed that the book is out of print. There are digital versions available from O’Reilly, but it appears most don’t know that. For the physical book itself, the least expensive used one on Amazon is $749.99. You read that right. $750! If you want a new copy, there’s one available on Amazon, and it’s $1000. I immediately jumped over to Camelcamelcamel.com to check the history of this book, thinking there must have been a run on Mr. Komar’s tome as Target, Home Depot, JP Morgan, and Sony Pictures fell. 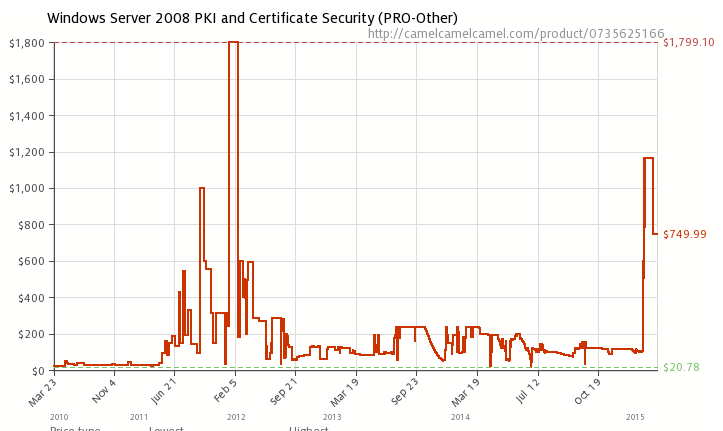 The price of this book has spiked recently, but Peak PKI was a full three years ago. I looked up security breaches/events of early 2012. Now correlation != causation, but it’s interesting nonetheless. Hopefully this means there’s a lot of solid Microsoft PKI systems being built out there! Rather than shell out $750 for the physical book, I decided to get Ivan Ristic’s fantastic Bulletproof SSL/TLS, which I highly recommend. It’s got a chapter on securing Windows infrastructure, but is mostly focused on crypto theory & practical OpenSSL. I’ll buy Komar’s as a digital version next or wait for his forthcoming 2012 R2 revision.